US-based Never Hungover LLC has formally launched a natural, sugar free and calorie free hangover preventative drink Never Hungover. The drink, which consists of natural antioxidants, amino acids, vitamins and minerals, helps the body process acetaldehydes – the toxins produced by alcohol – into acetic acid so it can quickly leave the body, preventing a hangover. 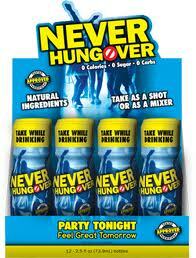 Never Hungover, originally created in 2006 as a post surgery healing remedy, can be taken as a shot or as a mixer. The hangover preventative drink is currently available in more than 200 convenience stores, groceries and bars throughout Austin or through the online store on the company website.